KIEV, Ukraine -- Voters in the Netherlands are heading to the polls Wednesday to decide whether Ukraine is on a path to eventually join the European Union two years after a revolution turned the country away from Moscow and toward Brussels. Ukrainian students hold European Union flags during a rally in Kiev, April 5, 2016. But polls show that Dutch voters are not ready to embrace Ukraine as an ally. For Ukraine, the vote is the latest event in unending political and economic turmoil. Revelations from the Panama Papers this week showed that Ukraine's president set up offshore holding companies at the height of Ukraine's war in 2014, the International Monetary Fund's next loan installment payment of more than $5 billion remains stalled due to political instability and conditions in the eastern war zone continue to deteriorate with almost 300,000 people requiring immediate food assistance. Taken altogether, it's another make-or-break moment for Ukraine to persuade Western power brokers that it is ready to join Europe. The Dutch referendum "concerns us much more than the IMF loan. That is crucial to the Ukrainian vector of movement and identity,” said Pavlo Sheremeta, Ukraine’s former economics minister and current professor and founder of the School of Public Management at the Ukrainian Catholic University. European Commission President Jean-Claude Juncker has warned a “continental crisis” is possible if Dutch voters reject the referendum. The other 27 members of the EU have already approved the pact that would allow Ukraine to deepen its economic and political ties with the union through visa-free travel and greater economic alignment. Amid their economic and political problems, Ukrainian politicians have been flying to the Netherlands in recent weeks to lobby for a yes vote. 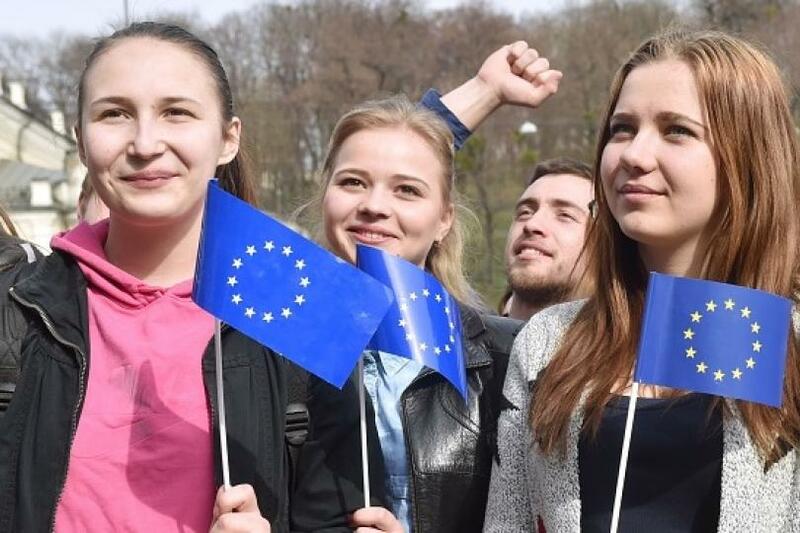 Ukrainians formed a human chain in Kiev Tuesday from the Dutch Embassy to the capital’s main European Square urging citizens of the Netherlands to support the country’s association agreement with the EU. A 30 percent voter turnout threshold must be reached in order for the referendum to go forward. Opinion polls have 66 percent of Dutch voters rejecting the agreement, Reuters reported. While the vote is non-binding, if an overwhelming majority votes “no,” Dutch Prime Minister Mark Rutte would be placed in an uncomfortable position of having to decide whether or not to veto the people’s decision. For many Dutch voters, the vote has little do with Ukraine and instead is a reflection of the EU’s expansion policies. “Ukraine vote is really about putting pressure on the Dutch relationship with Europe,” said Arjan van Dixhoorn, a history professor and one of the leaders of the euroskeptic Citizens’ Committee EU that pushed for the referendum. But Ukraine has its own problems to deal with. The vote comes as Ukraine’s fiscal service announced Tuesday it would investigate the massive leak of documents from the Mossack Fonseca law firm known as the Panama Papers, in relation to Poroshenko, a multimillionaire known for his large chocolate company Roshen. Ukrainian media were quick to jump on revelations that the president was involved in the creation of offshore entities in the British Virgin Islands, signing documents at the height of Ukraine’s war, that could potentially be used to avoid paying taxes in Ukraine. Economists and lawyers who have started digging into the accusations have so far backed the president, saying they did not see major wrongdoing. “There is nothing fundamentally wrong in the fact that companies owned by President Poroshenko set up these kinds of structures,” said Adrian Karatnycky, an specialist on Ukraine with the Atlantic Council think tank based in Washington. The resignation of several ministers over allegations of corruption by Poroshenko and his allies triggered a political crisis in February. A no-confidence vote against the prime minister failed to pass, but Ukraine’s lackluster fight against corruption and ongoing political crisis saw the IMF stall its next tranche of support as part of a $40 billion aid package. One of Ukraine’s largest foreign creditors, TCW Investment Management Co., also cut its exposure to the country’s bonds by three quarters, Bloomberg reported Monday. Economists have said IMF and other Western support is the only way for the country’s economy to survive in the long term. Sheremeta, who himself resigned his position as economics minister under Poroshenko’s government in August 2014, has argued that Ukraine has the reserves to survive for the next couple of months as larger concerns loom over the war that broke out in April 2014 pitting government forces against Russian-backed rebels. More than 9,200 people have died and over 1.4 million were displaced by the conflict in the eastern Donbass region. The conflict has also left 1.5 million people hungry, including nearly 300,000 people who need immediate assistance, the United Nation’s World Food Program said Monday, making Ukraine the only country in Europe so far in 2016 to require food assistance. Russian President Vladimir Putin, who has continued to deny direct military involvement in Ukraine, could see a victory with a “no” vote in the Netherlands. The Kremlin has long opposed Ukraine’s desired closer ties to the EU. “I’m concerned this [vote] could hurt the U.S., the West and Ukraine,” said John Herbst, a former U.S. ambassador to Ukraine and current director at the Atlantic Council. “It’s clear that one important objective of Putin’s security policy is to weaken the EU. They want a zone of influence to dictate the policies of their neighbors." Nearly two years after Poroshenko's election and promises of swift reform to battle corruption and turn the country toward Brussels, Ukrainians are still waiting. "I feel a strong sense of disappointment," Sheremeta said. There were huge expectations. Sometimes I think they were too high." Reform has been happening.....although the speed with which expectations could be met was not very realistic from the outset. Even tiny city-states like Singapore - with the full support of its government - required years, nearly a decade - to get its house in order. A country must chose whether to clean out corruption through its rule of law, or through arbitrary, autocratic means. If "rule of law", then it is hampered by all the protocols, parliamentary approvals, due process considerations, investigative restraints, etc. that allows for resistance, lobbying, foot-dragging and counter-pressures. If autocratic, then the very institutions that are critical of Ukraine's pace of reform would insist on "lawful" means. The bottom line is that the reforms that have been made (and they are very significant) will not be reversed, and that Ukraine's civil society will not shrug its shoulders in defeat and walk away. The pressure will continue and grow and the resistance and oligarchic influences will wane. The younger generation is increasingly insistent, impatient, and moving into positions of influence. Ukraine is irreversibly set on a course of ever greater reform, though not without occasional disappointments. As a former Inspector General of a US government agency, I am aware of the difficulty of initiating "reforms" of bureaucracies even in such established, affluent societies as the United States. It is incredibly difficult to do so in poor societies with their embedded, centuries-long culture of corruption and very dubious "tools". However very few nations can boast of two revolutions in a decade - compromising of as much as 2% of its population standing for weeks and months in the middle of winter - determined to achieve the high standards of integrity, dignity, and governance that had taken the West hundreds of years to attain.